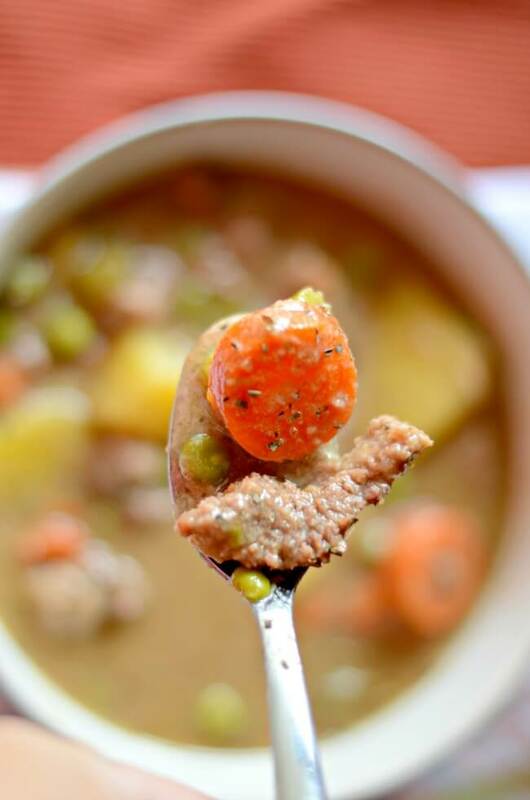 Feel warm and cozy with a bowl of this stove top beef stew. It doesn’t take hours to make and is hearty and full of veggies. 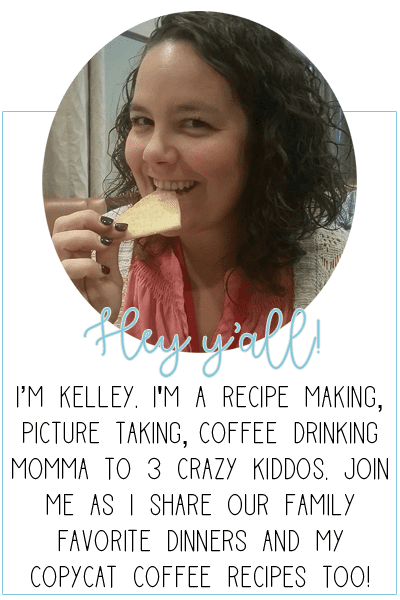 Let me show you how to make a batch today! Do you ever have a craving for something and have to make it RIGHT NOW? And then you go to your pantry and you have all the ingredients? It makes you want to dance a little, right?! That’s what happened when I had a craving for this stove top beef stew. I checked my pantry and fridge and we had ALL the ingredients! Even the peas! And yes, I did do a little happy dance. 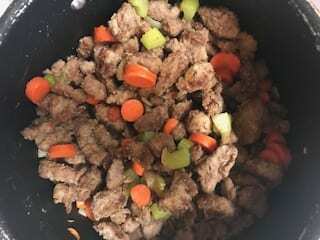 What is stove top beef stew? 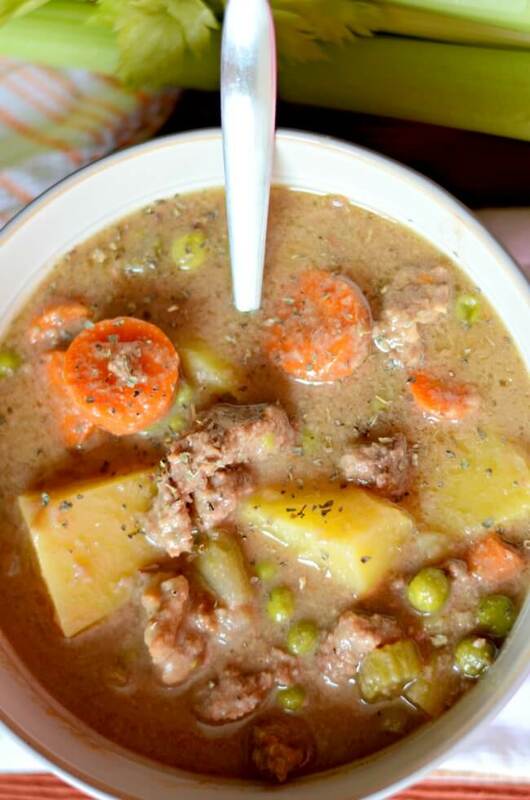 Stove top beef stew is a down home comfort in a bowl. 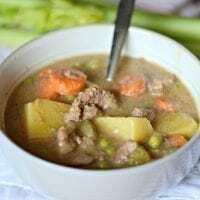 It is a beef dish that is full of veggies and a hearty broth. You start by browning the meat and then you saute and soften your veggies. 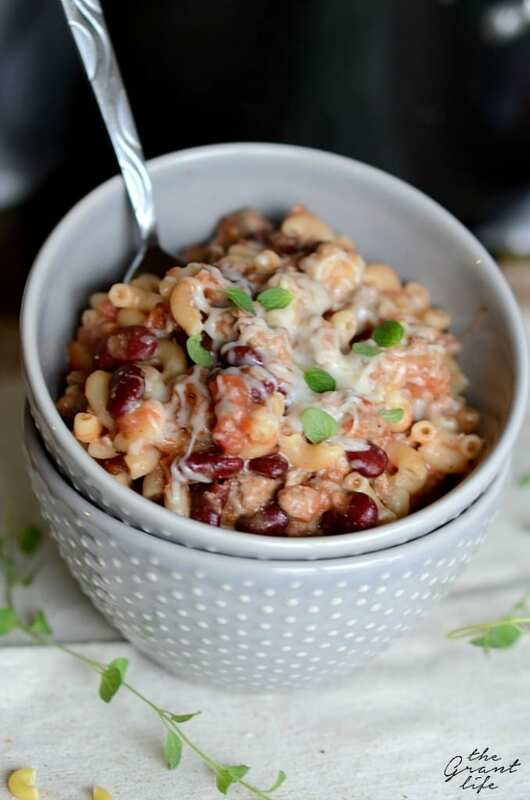 Then everything is tossed together in one pot and simmered to perfection. So it’s beef, vegetables and a hearty broth. Like I said, comfort in a bowl. Let’s talk about the beef you need for this beef stew. You need a hearty cut of beef for this stew recipe. Cuts from the shoulder or the rear are the best here. Look for some sort of chuck roast, round roast or pot roast. 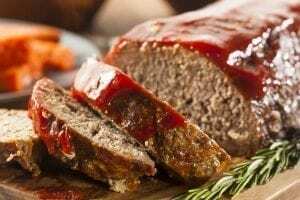 Some grocery stores even have the meat pre-cut and tenderized so look for packages labeled “stew meat”. Feel free to use any type of potatoes you prefer. I like Yukon gold or reds, so that’s what I used in my stew. Any type of potato works here. You can even make this recipe Whole30 compliant by using sweet potatoes! Also, feel free to use whatever type of celery, onion, carrots and peas you like. You can also omit any of the vegetables you don’t like. Hate peas? Don’t add ’em! The recipe stays the same no matter what veggies you add or subtract. 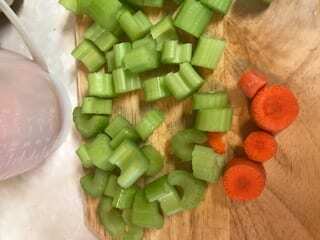 For the beef broth and the spices – use a good quality beef broth here. It helps with the flavor of the stew. Same goes for the spices. Use a good quality on all your spices to get the best flavor here. Also, feel free to add or subtract the spices based on your liking. How do you make beef stew on the stove top? 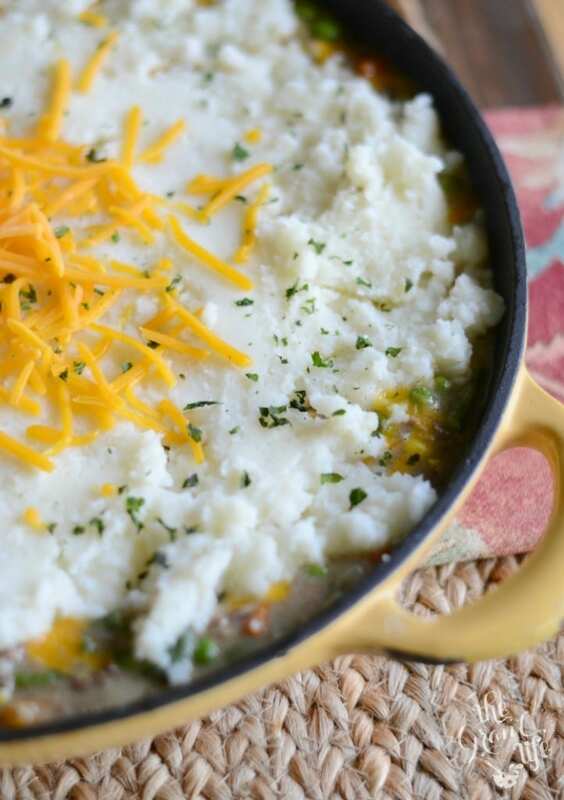 The beauty of this quick and easy dinner recipe is that it is fairly simple to make. There are a few steps that you have to follow but they are easy. This recipe is also pretty forgiving, meaning if you make a mistake or forget to add something, it will still turn out delicious. To start you want to cut your beef into chunks. Next, add it to a pot with a bit of oil and allow to brown. 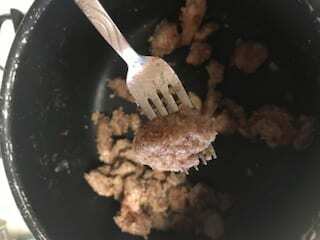 I like to add flour to my beef before adding it to the pot to brown, but it is not necessary. It just gives the meat a little bit of crispness, even after it’s stewed on the stove. Remove to a plate to be added back in later. Chop your vegetables and add them to your pot with a bit of butter or oil. Allow them to soften until they are fork tender. Add your meat back in, along with your spices, broth and water. Bring to a soft boil and allow to simmer for up to an hour. Add your potatoes in the last 30 minutes and cook until they are fork tender as well. Give it one finally stir and dish into bowls. Your stove top beef stew is now ready to enjoy! 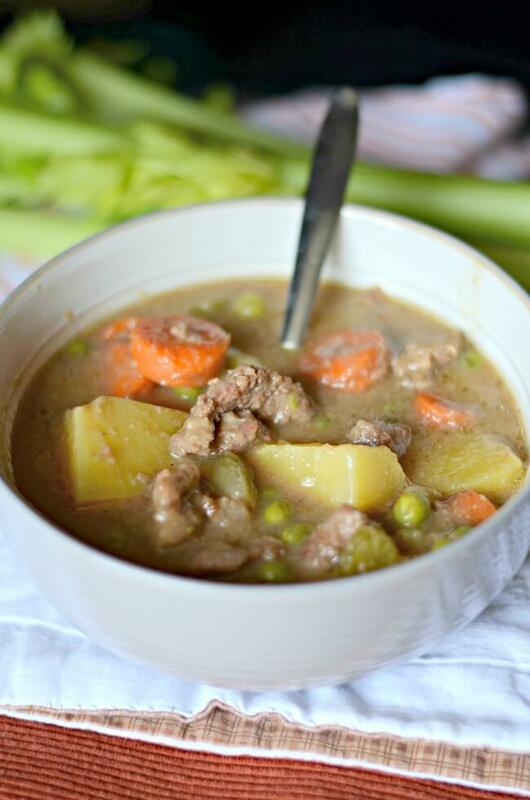 Make a bowl of comforting stove top beef stew today! 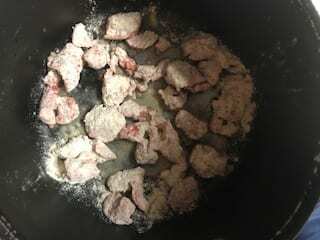 In a bowl, combine the flour, all the spices and the cubed stew meat. Do this in batches to ensure even coverage. 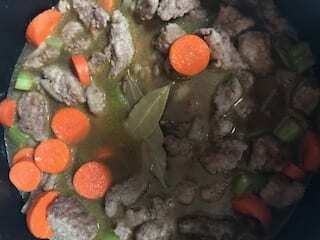 In a large pot, over medium heat, add the oil and the floured stew meat. Allow to brown on both sides - about 2 minutes per side. Do this is batches as to not over crowd the pot. Remove the meat from the pot and set aside. 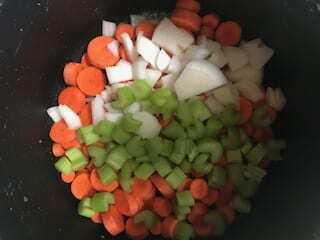 Add the butter along with the celery, carrots and onion. Saute until fork tender, about 7 minutes. Add the stew meat back into the pot, along with the 2 cups of beef broth and 1 cup water. Bring to a simmer and allow to cook for 30-45 minutes. 30 minutes before you are ready to eat, add in your potatoes and bring to a boil. You want the potatoes to be completely under water so add the last cup of water, if needed. Boil until fork tender. Remove from heat, allow to cool slightly and serve.